Each of these tools should be used to search for different types of information held by the ADS. Archsearch is for searching metadata records about monuments and historic environment events in the UK. 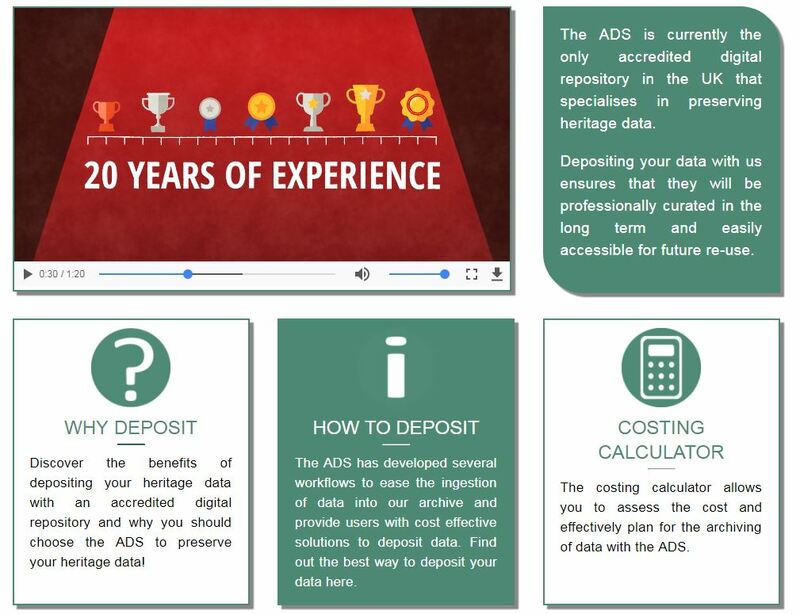 The ADS Archives is the place to search for historic environment research data (such as images, plans, databases) and contains international and UK data. The ADS Library is a bibliographic tool for searching for written records on the historic environment of Britain and Ireland. Where possible, the record will provide a direct link to the original publication or report. 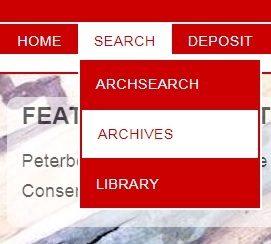 Close up of the drop down menu available on the new website. In order to make the differences between these search tools clear to users, and to make all three tools easy to find from our main website, they will be introducing a new website menu with drop-down links that enable a user to go straight to each of our search resources. This new drop-down menu can be seen in the image on the right. Users will also be given the option to access a main search page that will explain the differences between each of the available search options. This page will then allow you to choose which search facility to send your chosen keywords to. 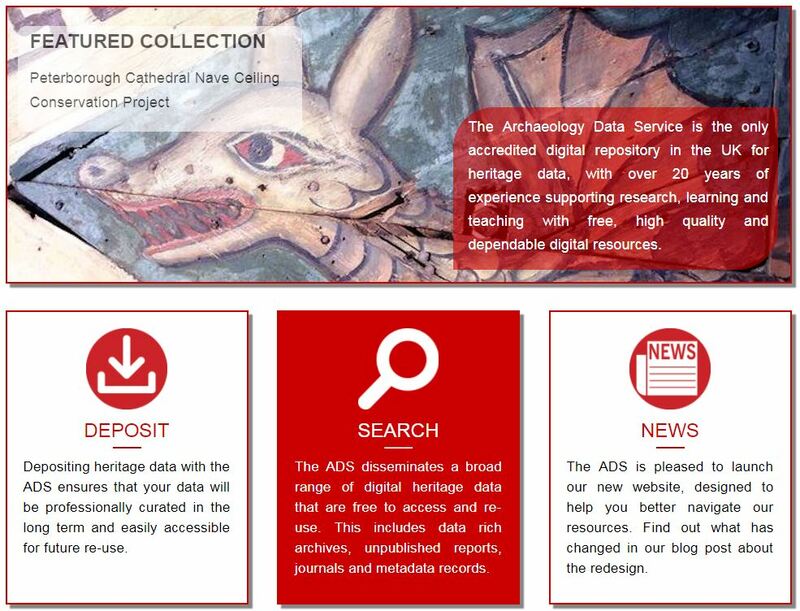 The ADS has also taken this opportunity to redesign the layout of our website, creating a bold new home page, designed to better highlight our featured collections and news items, while providing links to our new search and deposit pages. The new Deposit page will also provide clearer links to the different types of data deposit options available to researchers wishing to archive data with the ADS. The new design will include a help tab on our menu with links to frequently asked questions and our contact details, allowing users to troubleshoot problems faster and get the right help quicker. The new design will reduce the number of main tabs in the menu. This means that some of our resources have moved location. For example our Teaching and Learning page will now be found under the Advice tab. However, despite the reduction in the number of main options on the menu, the introduction of the drop-down feature will mean that, in practice, more pages will be directly accessible from the menu than previously. Overall the new design will surface the most important pages of our website better and make our key resources accessible via fewer clicks. Although the design and structure of the website has changed, and some things may now be found in a different location, very few URLs have changed. Only out-of-date pages have been removed so bookmarks to specific pages should still work, and Archsearch, the ADS Archives and the ADS Library are still navigated in exactly the same way. If you have any trouble finding resources please contact help@archaeologydataservice.ac.uk .